Happy 11th Anniversary To Us! 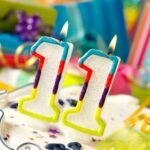 So today is Stephen Green and Associates 11th year as a limited company! We started as a little company operating out of Steve and Debbie’s house, since then have grown considerably over the last 11 years. We have moved to a much larger office space at Snetterton Business Park and our staff numbers have increased to 13. We would like to thank every single person who has helped us get to where we are today and we are all excited to see what the future holds for us.